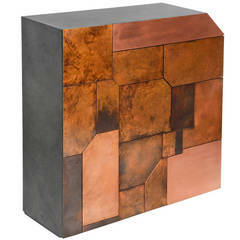 The Elementi copper patina cabinet is a monolithic, rough and challenging piece of sculptural furniture. Clad with copper sheet patina mosaic which disguises two cupboards and five drawers behind it. Available to order in a number of different patina's - both a 'burned burr' and the blue/green verdigris are pictured. Crafted in Andrea Felice's London studio, each cabinet in the series will have a different patina due to the hand applied nature. Patina will vary in tone and pattern somewhat. The cabinet is completely customisable. Originally designed with a Black board exterior other wood finishes such as Oak and Walnut are available as well as Lacquer. Drawer and Cupboards can be lined. 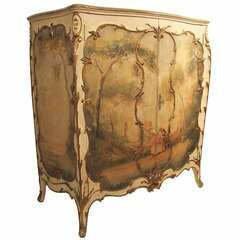 Shapely, hand crafted, carved, and hand painted chest with seven interior drawers. Early 20th century, France.